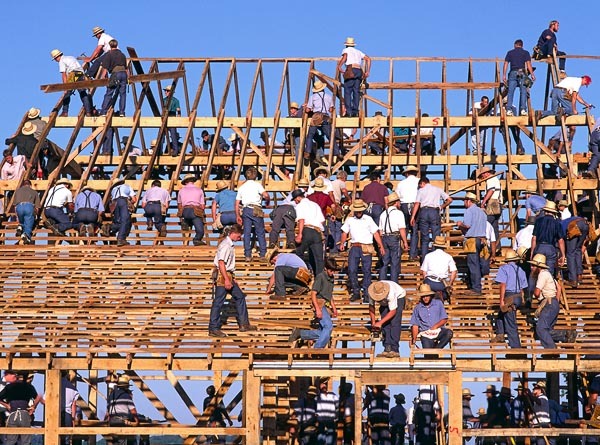 A little over 15 years ago, while I was briefly living in New York City, I took part in an Amish barn raising. A series of arsons inflicted on one Amish community in Pennsylvania had been reported by the New York Times, which also published the date and locale of the barn-raising. I’ve always been handy and, being curious as well, I decided to drive out to lend a hand. It was one of the most rewarding and revealing days of my life. I’ll only gloss over the highlights: arriving about 7:30 a.m. to find hundreds of Amish already setting up for work; leaving about 12 hours later as the metal roofs of three finished barns reflected the setting sun; drifting from task to task throughout the day, mixing concrete for a while to pour on the floor of one barn, joining another group that was hoisting beams as thick as my body into the rafters by use of ropes and pulleys. the Amish themselves were not of a single sort, and had a considerable variety of tolerance for technology, going all the way from those who only used hand tools to the Beachy Amish who actually drove to the gathering in cars. Wikipedia, Flickr, Digg, YouTube, are all examples of sites that have risen to prominence on the strength of many hands contributing labor to a common task. And in each instance the groundwork for success was laid in advance by smaller teams that created the structures that could scale as more people show up. So new media already has a touch of the Amish. Perhaps what the new media, grassroots media need are more organizations that tap into this agrarian-ethic of cooperation. Some weeks ago I advanced the idea for such an organization in a blog titled, “A Mini Media Community?” The idea has been ignored. I think that’s a pity and I’ve reposted that entry below. Please think on it, perhaps react to it if so inclined. I continue to look for people who are interested in the cooperative I outline below and I will keep trying to find new ways to make the idea compelling. Publishing has never been easier. It’s relatively simple to throw up a website, start a blog, create a video or record a podcast. But there’s no easy way to turn a media hobby into a media business. So here’s a suggestion — media producers should create a community, so we can share what we’ve learned and ask questions. There’s just no good reason — other than the considerable difficulty of organizing — that each of us should have to learn the same hard lessons alone. Obviously a web community is the place to start. It would be relatively easy to create a portal for small media producers, a place where they can ask technical or ethical or business questions; find out what others are doings; learn who’s using what tool for what purpose. The quality of the site would depend on who joins and how much effort and trust they choose to invest. If you have any interest in this please say so. Or pass this idea on to a friend. What sorts of activity might be expected or useful on such a site? – group health insurance; any business very quickly confronts the need to insure the pricipals and core employees; could an association of media producers form a group health buying pool? – group purchasing power in acquiring software, hardware, licenses and other media tools; we are all going to be buying and using much the same tools; can we get better prices and support by pooling our purchasing power? – group negotiating power to create standard contracts for selling content to or licensing content from mass media; do you have the competence and clout to negotiate with Disney or Google? It’s not a knock on these companies, it’s just a fact that, alone, it will be the rare media producer who can command the attention of the media giants. – backshop services such as hosting; backup and recovery; payroll; billing; etcetera. – professional training and classes; ethical standards of behavior and alternative dispute resolution. I envision this media group organizing itself as a producer cooperative. That means the individuals or companies that join the coop would own it. Coops have their place in European and American history. They concentrate the economic power of consumer or producer groups. Some coops have blown up due to political infighting. Others have endured for decades, especially in agricultural production. How might such a producer cooperative come together? Well, my crystal ball is cloudy. I’m not even certain there’s interest in such an idea. So let me suggest that after the first thousand members join such a group, those people hold a convention, conference or whether method seems appropriate to create a permanent governance structure. Until then I will simply try to recruit an advisory board of people willing to invest their own time and prestige into lifting such a group off the ground. What to call this group? There’s another open question. I have registered the domain “minimedia.org” and I think that’s an appropriate name. It’s an easy contrast to mass media. But my buddy Tim Bishop said it’s unwise to build an identity around a term without ownership of the dot.com version, and minimedia.com is under construction. So as far as the name goes, perhaps the people who are interested will have to invent one. Anyhow, this is getting to be a longish post and it’s time to find out if there is any interest, criticism or suggestions that pertain to this basic theme — that small media producers will have to aggregate themselves in some way in order to give themselves a better chance at success. I remember something I heard a long time ago from Tim O’Reilly. This was back when he sold what was then the Global Network Navigator to AOL in one of the first deals that proved there was value in web publishing. O’Reilly said something to the effect that the Web was going to create a thousand million-dollar opportunities. The idea was that this publishing revolution was going to enable a lot of small opportunities. But if you look at the way the venture capital and mass media have played the Web, or Web 2.0, the opposite has turned out to be the case. We are enamored of the MySpace deal, of the YouTube deal. We seem bent on recreating the old media world in which a handful of dominant players loom over the landscape. I’m not suggesting we try and stop that. I don’t believe anything can stop big money from doing what it wants. But I am suggesting that the opportunity exists to create a structure that would enable small media producers to grow larger and thrive as businesses — to create the thousand million-dollar ideas of which O’Reilly spoke. Or a million of them. To make one Chad Hurley changes little. To make a million mini-Hurleys would make all the difference in the world. This entry was posted in Citizen Journalism on February 21, 2007 by Tom Abate.